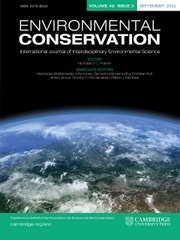 As part of the 7th International Conference on Environmental Future: Humans and Island Environments, a series of invited papers are being published in the Foundation’s journal, Environmental Conservation. There are also a number of papers that have been contributed through an open call for papers on the theme ‘Humans and island environments’ . This list of all these papers will be updated as they are published throughout 2017 and into early 2018.